The Lesser Town Bridge Tower (Malostranské mostecké věže) is situated at one end of Charles Bridge and forms part of an ancient gate to the Lesser Town. The tower was built under the rule of King George of Podebrady in the second half of the 15th century to replace an earlier Romanesque tower. The model for its construction was the Old Town Bridge Tower sited at the other end of Charles Bridge, which was constructed earlier. 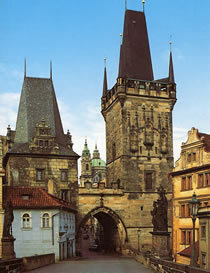 The Lesser Town Bridge Tower is 43.5m high and is a rare surviving example in Prague of the post-Hussite Gothic style. Connected to the Lesser Town Bridge Tower by a walkway is the smaller Judith's Tower. This is the only remaining part of the original Prague crossing, Judith's Bridge, which was destroyed by floods in 1342, and subsequently replaced by Charles Bridge. Inside the Lesser Town Bridge Tower is an exhibition dedicated to the eventful history of Charles Bridge, with graphic descriptions of the invading armies that have crossed it. Visitors can climb the tower for fine views over the Vltava River and the centre of Prague.